Who are the three most exciting players on BCS and non-BCS teams to watch this season? That’s a speed question. 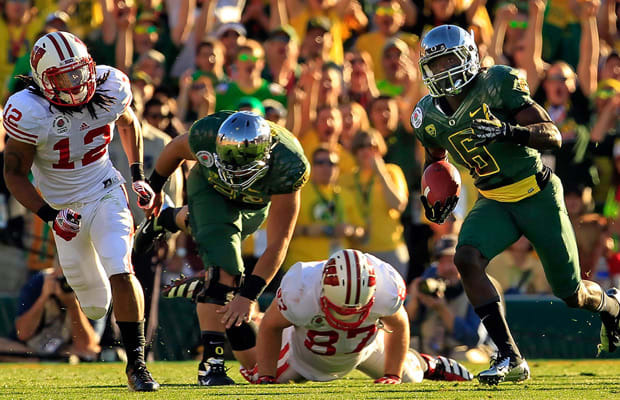 De’Anthony Thomas can just fly. Tavon Austin at West Virginia, being in a new league with an experienced quarterback, he’s an exciting player. I would have said Tyrann Mathieu because of his return game and what he does with turnovers, but we won't see him. Denard Robinson (Michigan) is just really exciting and makes their offense go. As far as non-BCS, Tracy Lampey at Southern Miss, Ryan Aplin at Arkansas State can run and throw, so he will put up big numbers. Garrett Gilbert, the former Texas quarterback, who's now at SMU will be interesting to see in June Jones’ offense.